Israel was the first nation to make significant use of unmanned reconnaissance drones in combat during operations in Lebanon in 1982. The United States forces began full deployment and use of unmanned aerial vehicles (UAVs) and related technology in the 1990s and UAVs—especially the Predator and Global Hawk—were extensively used by U.S. forces during Operation Enduring Freedom in Afghanistan and Operation Iraqi Freedom. UAVs can fly in areas where air supremacy is not complete or air defenses have not been fully suppressed. UAV craft can also operate in biologically or chemically contaminated areas. In addition, UAVS offer a chance to conduct battle damage assessments—critical for further mission planning—without further risk to pilots. As of May 2003 more than 1500 UAV sorties had been flown in Afghanistan and UAV craft destroyed, or assisted in the destruction of, nearly a thousand targets. In addition to the capability of some UAVs to fire Hellfire missiles, UAV can paint targets with lasers that guide other weapons systems. The Predator flies at medium altitudes and is capable of long reconnaissance and surveillance missions. In conjunction with weapons systems, Predator craft are also used for target acquisition. The Global Hawk, is capable of operating at higher altitudes (in excess of 60,000 ft) on and features an integrated sensor system that enhance its intelligence, surveillance, and reconnaissance capabilities. The U.S. Navy operates the Pioneer UAV. Designed to operate over open ocean, the Pioneer design incorporates a low radar cross section and reduced infrared signature. Pioneer craft were first used during operations in Grenada and strikes against Libya. The Shadow UAV offers day and night surveillance capability and can carry a 330 lbs. Payload while operating at 10,000 ft. The U.S. Army uses Shadow UAVs to call in or lock on (calibrate) artillery attacks. UAV use has also spurred advances in miniaturized synthetic aperture radar that reduces weight but still offers high stationary and moving target resolution (i.e. radar that can discriminate targets separated by less than 18 inches (.5 m). UAVs as platforms for weapons of mass destruction or terrorism. Prior to its being eliminated by U.S. forces, U.S. officials claimed that Saddam Hussein's Iraqi regime had developed and tested a limited number of UAVs capable of delivering biological agents. 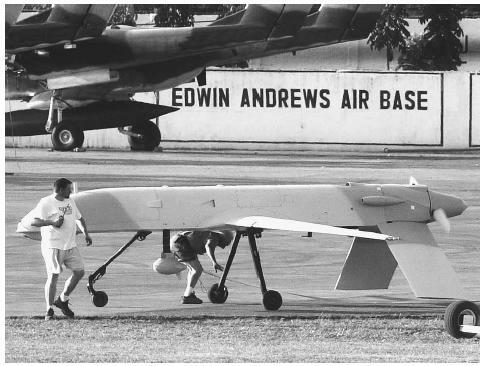 The U.S. military used several unmanned spy aircraft such as this GNAT Aerial Reconnaissance Vehicle to help the Philippine military hunt down Islamist extremist guerrillas on the Philippine island of Basilan in 2002.
target inside Israel. Hamas spokesmen subsequently claimed that they been fooled into purchasing a booby-trapped UAV by the Israeli Security Agency ISA (Shin Bet). Western press organizations have also carried reports that Palestinian agents have attempted purchases of model aircraft from suppliers in Europe with the intent to develop a crude but UAV capability. One factor limiting these types of operations is that typical hobbist UAVs require line-of-sight control of the aircraft and are therefore incapable of navigating with precision over rugged terrain or over great distances. UAV use in intelligence operations and current research. In November, 2002, a CIA-operated Predator operating over Yemen fired a missile that killed bin Laden's top lieutenant in Yemen, Qaed Salim Sinan al-Harethi, and five other al-Qaeda suspects. DARPA planned advancement of the Unmanned Combat Air Vehicle (UCAV) and Unmanned Combat Armed Rotorcraft (UCAR) is designed to enhance the ability to remotely suppress enemy air defenses, conduct extended surveillance in hostile territory, and pursue armed reconnaissance and attack missions. A milestone in unmanned aviation, in 2002, the U.S. flew an unmanned plane on a trans-Pacific flight from California to Australia. DoD and Northrop Grumman engineers are currently refining the Eurohawk for advanced electronics and signals intelligence operations. France is developing the Système de Drone Tactique Interimaire (SAGEM) and United Kingdom is developing a craft termed "Watchkeeper" to replace the Phoenix. Airborne Autonomous Systems. Unmanned Aircrft.< http://www.unmannedaircraft.com/ > (May 12, 2003). American Forces Press Service, Garamone, Jim. "From U.S. Civil War to Afghanistan: A Short History of UAVs." April, 16, 2002. < http://www.defenselink.mil/news/Apr2002/n04162002_200204163.html > (May 12, 2003). Thank You! This site has helped me in my research paper. I am a undergraduate at heald collage and am even more excited now then I was before,I started my project. The site has been helpful and informational.